With thanks to Paul Longbottom who kindly transcribed the following Keighley News articles. A local builder, William Pickles, told him the new pinnacle was built by Mr James Lund and that the architects were R.B. Broster & Sons, Keighley. The first plan was labelled the Ethel Tower. There was delay, and then it was labelled Hanging Stone Tower. The masons were Heaton Pickles, James Whiteoak and Thomas Binns, the first two of Sutton and the last of Cowling. The labouring and carting were done by Martin Marshall of Sutton Mill." The meeting concluded with a discussion "but an agreement was not reached as to how the new pinnacle came to be built by the late Mr James Lund, some claiming it was built to commemorate the Victoria Golden Jubilee, and others that it was to celebrate the 21st birthday of his daughter Ethel". Mr Norman Davy, late of Cowling, now lecturer in physics at Nottingham University, states that the building was intended to be ready to commemorate Queen Victoria's Diamond Jubilee in 1897, but it was more probable that the tower was completed about the time of Miss Lund's 21st birthday rather than about the time of her marriage. On the authority of the late Mr John Stell, of Sutton, Mr Lund's intention was to build the tower to commemorate the Queen Victoria Jubilee of 1887, not the Diamond Jubilee of 1897. Mr Stell's opinion might be regarded as final, as he was a well-known authority on such matters. 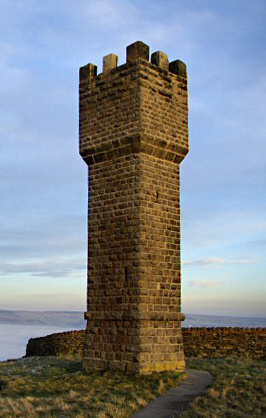 In the old notices issued to the Haworth Ramblers over a very long period of years regarding their explorations in the neighbourhood, frequent reference is made to "Lund's Jubilee Tower." The writer of the notes was the late Mr Jonas Bradley, Horton Croft, Stanbury, the Bronte schoolmaster and president of the Haworth Ramblers. He states that it was built for the Jubilee of 1887. This is verified in information received from Mr John Bradley, 6 Hartley Place, Cowling the nephew of Jonas Bradley, who adds that the tower was linked by local people with the death of Mr Lund's daughter, Ethel, and was known locally as the "Ethel" tower.